Tech Coast Angels (TCA) created the Angel Capital Entrepreneur Funds I, 2, and 3 (ACE FUND) as an investment opportunity to both accredited individuals and institutional investors. The ACE FUND provides investors with the opportunity to participate in a diverse pool of dynamic early stage companies selected utilizing the vast expertise and experience of the TCA and its membership. The ACE FUND focuses on companies with early exit potential providing investors with early liquidity. One of the most important benefits for members of the ACE FUND is access to deals closed to angel networks such as TCA because they may have been oversubscribed, or are from geographic areas not visible to TCA or its partners. 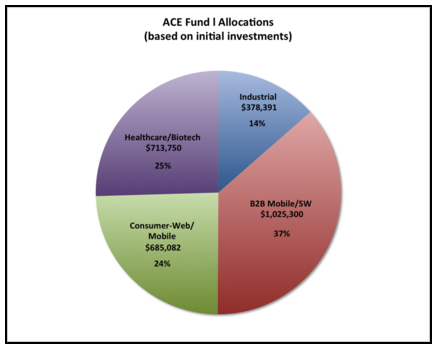 ACE Funds I,II, and III are closed to new investments. View the ACE Fund III PPT presentation by Dave Berkus HERE. For additional information, email acefund2@techcoastangels.com.